I spent the day hanging out with my all time favorite lady - my mother. We had a jam packed, productive day of running errands, putting invitations together for the wedding and doing a little baking in between. Sometimes when I come to spend the weekend with my parents, I will bring over food that I know will go bad if it sits at my place over the weekend. This weekend, I brought bananas. And it just so happened, my mom had a bunch that were nearing the end of their edible existence as well. As much as all of us love bananas, we knew there was no way we were going to eat them all while they were still good. Oftentimes, we freeze them and and use them for smoothies, but today we decided to get a little more creative. 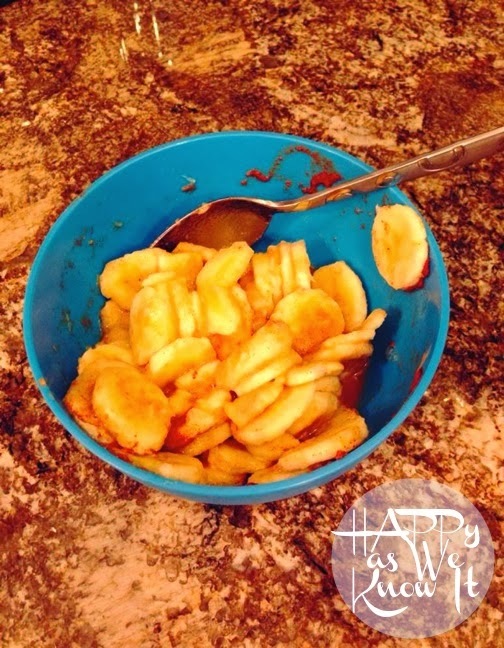 First, we decided to try our hand at banana chips. 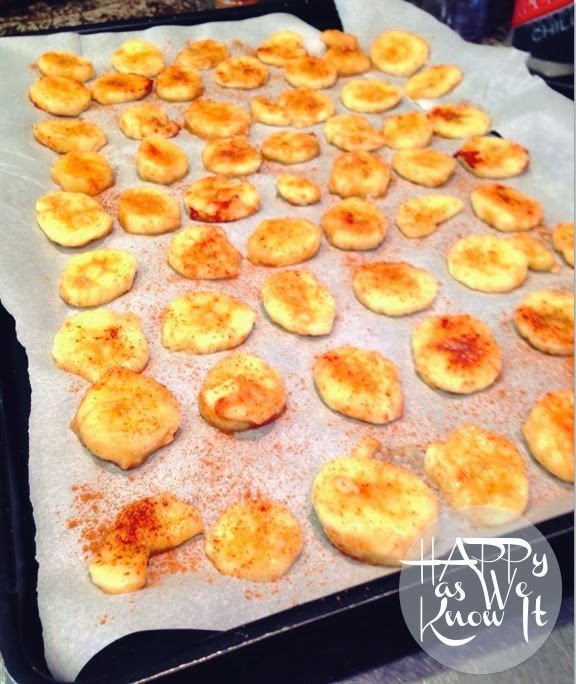 Once we had chopped up a good amount of our banana stockpile, we coated them in a lemon juice and cinnamon mixture. ...and there ya have it. 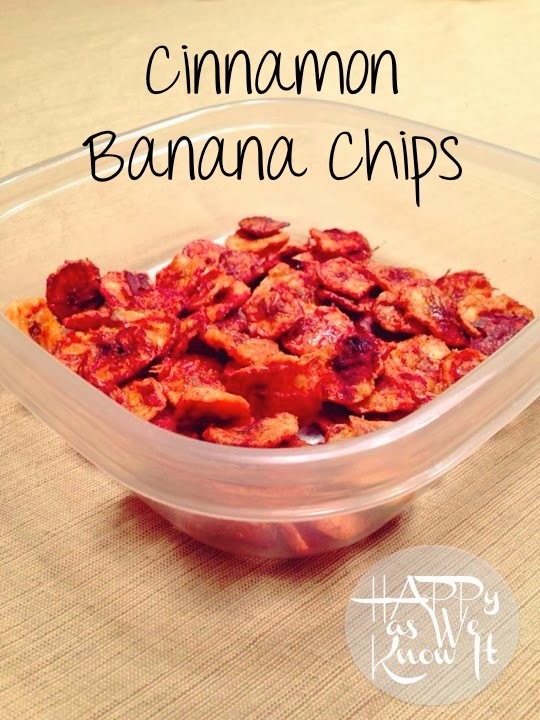 I will say that if you enjoy your banana chips a bit more crunchy, this may not be the recipe for you. Ours came out delicious - but a bit on the softer side. While baking our chips, we decided to create something a bit more dessert-like. My mother and I both have a sweet tooth with chocolate on the mind. 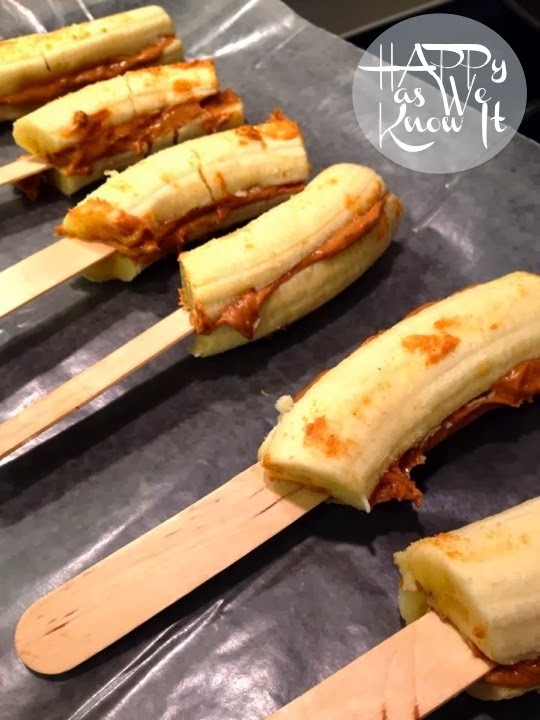 Thus, when we came across this recipe from Spoonful for Nut Butter and Cinnamon Filled Frozen Banana Pops, I knew we had found our match. We started by chopping the ends off of our very ripe friends and slicing them in half. 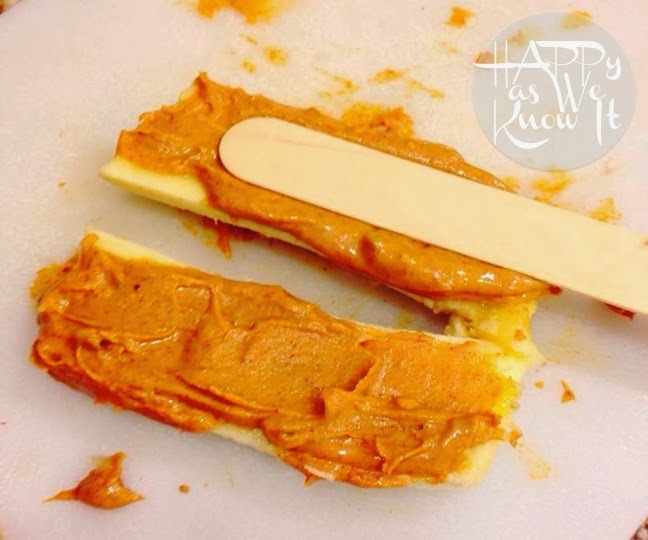 Then we spread a heavenly almond butter, peanut butter, and cinnamon concoction onto the two halves and placed a popsicle stick on one of the halves. Now I know that you are thinking that popsicle stick looks awful large. You would be right. We actually used large craft sticks that I had found amidst some of my teaching craft supplies. So while they are a little large and in charge - they were free! Once we finished putting together our pops, we froze them for about 30 minutes before starting the next step. 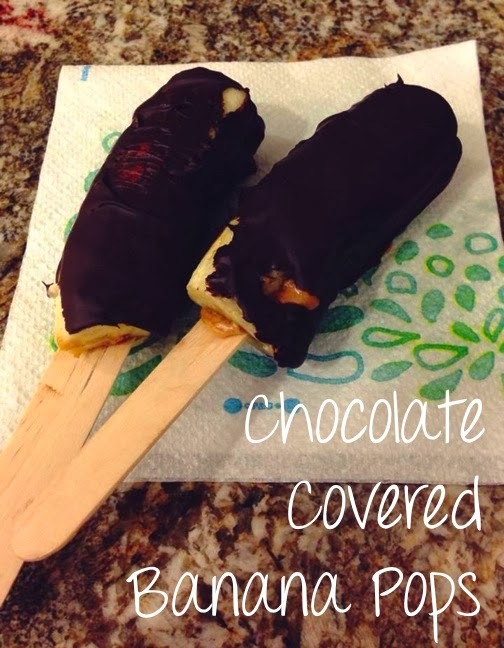 After they were good and solid, we rolled on our coconut oil and melted chocolate deliciousness. As I try my best to steer clear of dairy, we used the Enjoy Life Dark Chocolate Chips which taste just like the real deal. 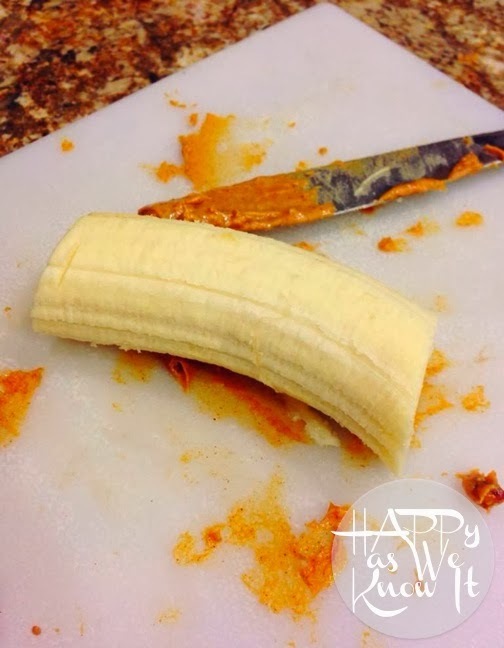 I would recommend doing the rolling in a dish or space large enough for you to roll the whole banana and stick at the same time. It creates a lot less mess! Then just place them back on the cookie sheet to freeze again for a few minutes and enjoy. 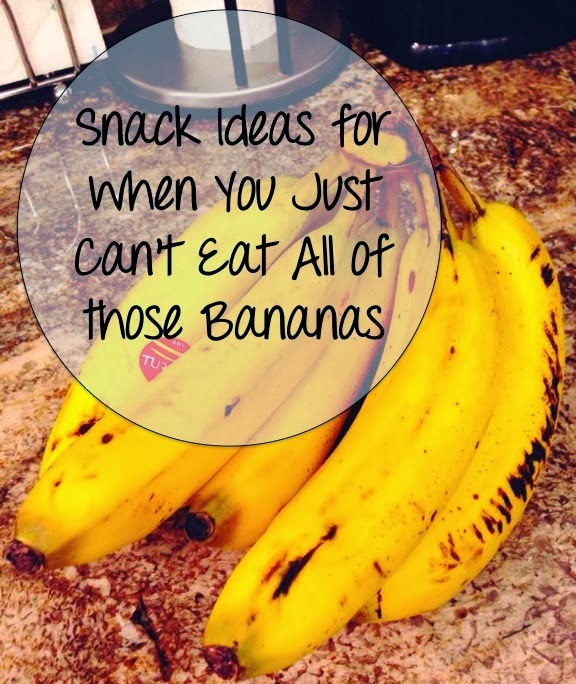 What are some of your favorite banana snacks? You two are ridiculously cute and I hope you have some fun treats to try next weekend while I'm home! 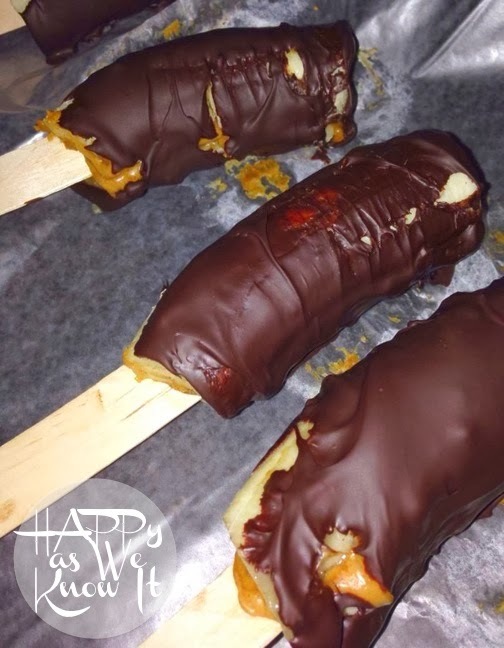 There is always room to make more if you'd like to join in the baking fun ;)!